February 5, 2018 (London, ONT) – Today, LondonOntarioGolf.com (est. 2004) names St. Thomas, Ont. resident Lindsey Edmunds as the winner of the 8th Annual London Ontario Golf Heart Award. LondonOntarioGolf.com publisher and editor Jeffrey Reed, a long-time nationally-published golf journalist, created the Heart Award in 2011 in order to recognize a community member who has given back to the game. The award recognizes local golf industry members within the categories of golf professionals/instructors, golf mentors, golf course owners/operators, golf course architects/designers and media members. Edmunds, 34, along with her father, former Western Mustangs women’s golf coach, Alan Edmunds, founded the Western University Mustangs women’s golf program in 2002. Without school funding, and with no Ontario University Athletics (OUA) women’s golf, Lindsey arrived at the idea of establishing a women’s division within OUA men’s golf tournaments. Today, a highly-successful Mustangs women’s team competes within a separate OUA women’s division, and competes nationally at Golf Canada-sanctioned tournaments. Upon graduation from Western in 2005, Edmunds joined golf’s professional ranks, but in 2008 she suffered serious injuries after being hit by a car at a crosswalk while she was jogging in London. She was treated for whiplash, dislocated ribs, a severely sprained left ankle and a contusion to her right knee which later saw a blood clot develop, requiring surgery. With dreams of playing on the LPGA Tour gone, she was unable to walk the course for four nearly four years. Her first time walking during a round was in 2012 at the inaugural Manulife Financial LPGA Classic at Grey Silo Golf Club in Waterloo, where she competed on a sponsor’s exemption. In 2010, Edmunds joined Nike Golf as Southwestern Ontario equipment and apparel sales and fitting representative. At the time, she was the only female equipment rep in Canada. With Nike’s golf focus solely on apparel today, Edmunds continues to represent the brand made famous by Tiger Woods. Heart & Stroke is the charity of choice for LondonOntarioGolf.com, and its sister publication, LondonOntarioSports.com. The Heart Award, named to honour Heart & Stroke as well as the extraordinary accomplishments of the annual winners, is announced in February of each year to recognize Heart Month. Visit the Heart & Stroke website here for more information. Traditionally, the Heart Award banquet is held in June – Stroke Awareness Month. But this June, Edmunds, along with her fiancé, David Hummel, are expecting their first child. This year’s awards ceremony will be held on Monday, April 30 at Highland Country Club in London. Media are invited for lunch and interview/photography opportunities, details to follow. 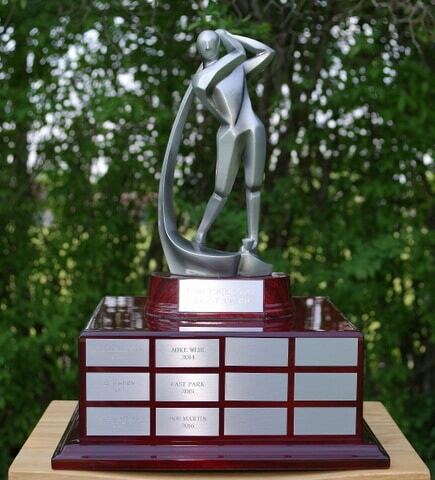 For information on tickets to the lunch and award ceremony, email news@londonontariogolf.com. More details about Lindsey Edmunds’ career in golf are available in a feature story published here. Full biographies of each of our past winners is available at https://londonontariosports.com/the-heart-award/ .